I always take my lunch to work. I have for years. Actually I took my lunch to school. My Depression-era mother couldn’t see paying for a school lunch. I guess that thriftiness rubbed off on me. At times I can recall this kind of bothering me – especially in school, when the “cool” kids were buying their lunches and didn’t have to schlep a lunch bag to school -- you know how your thoughts get influenced by peer pressure. Yes, at times I have been a little self-conscious about taking my lunch. Usually, I sit at my desk and eat my lunch. Most of the time this is because I fit my workout in my lunch hour so I don’t have the time to be away from my desk when eating. This habit also keeps the contents of my lunch away from the scrutiny of others. When I was working at a high tech company and decided to join the group for lunch one day, a woman asked me, “Why do you eat like you live in a third world country?” My internal dialogue went something like: 'Hmmm – because it is healthy? Because I think it tastes good? Make note to always eat at desk. '” I guess she was confused because most people working for high tech companies in the 1990’s didn’t bring beans and rice to work for lunch. I wholeheartedly agree with Dr. Grandma when she says -- in her blog Spending a Fortune on Food in Order to Eat Healthily -- that you can make healthy meals at home for a modest cost. Although agri-business has managed to cut the prices of fast food, in my opinion it is expensive to eat fast food and much cheaper to prepare your own. At first taking my lunch to work was a money thing – I didn’t have an excess of it and I wanted to hold on to what I had. If I conservatively estimate that I would spend $5.00 a day eating out and only $1.00 to take my lunch – a net savings of $4.00 a day -- I save $960.00 a year taking my lunch -- eating out only two or three times a month. Not too bad – and it adds up too, over a 10-year period - $9,600.00, over a 40-year career $36,400.00. Perhaps the real key is in what I don’t get from the meals eaten out. Lets say that in eating out I usually go to fast food places, since I don’t have much time and I won’t get much else for $5.00. Below, I analyzed typical fast food lunches, mixing in more healthy ones with less healthy ones. As you can see, your choices make a big difference in the fat and saturated fat categories, with high sodium and sugar numbers showing up in surprising places. Excluding the veggie sandwich and the salad, these lunch have much more fat, saturated fat and sodium that my homemade lunches. What I don’t get from eating out is fiber, vitamins and the phytonutrients. Results compiled from 10 studies conducted in the United States and Europe found that total dietary fiber was associated with a 14% decrease in risk for all coronary events and a 27% decrease in risk of coronary death. Having a low fiber diet also puts you at greater risk for hemorrhoids, constipation and a constant bloated feeling. So I will continue to take my lunch to work. Adding whole grains such as Dr. Grandma’s muffins or The Best Corn Bread Ever to my lunch is a treat that I have only recently discovered. 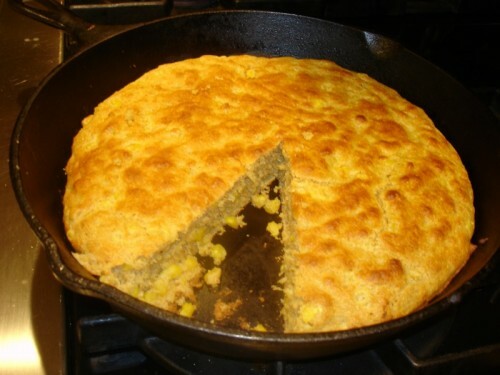 The Best Corn Bread Ever really is! I added whole corn to The Best Corn Bread Ever recipe -- very yummy. You should try it. I had technical difficulties with my camera, so I have pictures for only the beginning of the process and the end product! 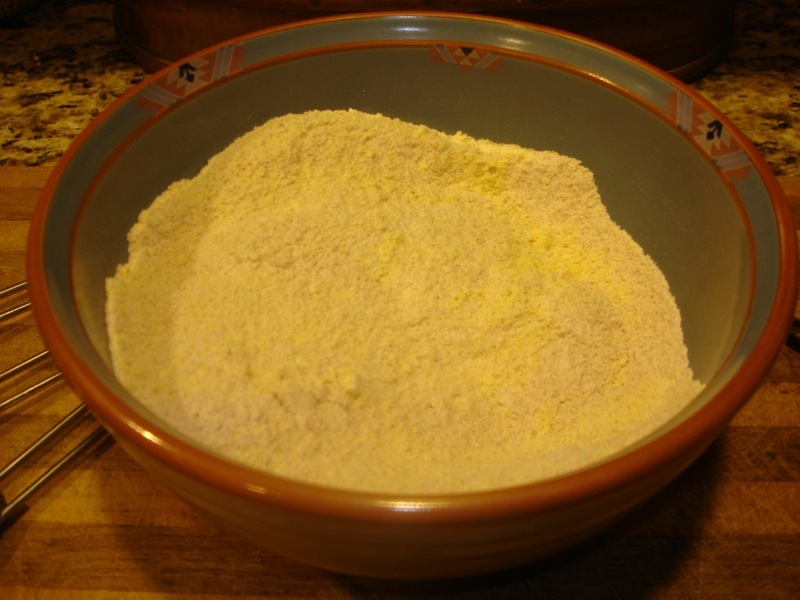 ¾ cup yellow cornmeal [Note: Whole cornmeal is your healthiest choice; not degermed. Some people thing that degermed has something to do with killing germs; but it really just has to do with the a little thin layer of bran and the germ (same as in wheat, only that’s wheat germ). Also, don’t use self-rising corn meal for this recipe]. Preheat 9 X 9 glass dish in 450°F oven for 5 minutes. I used a cast iron skillet. Mix all dry ingredients together. 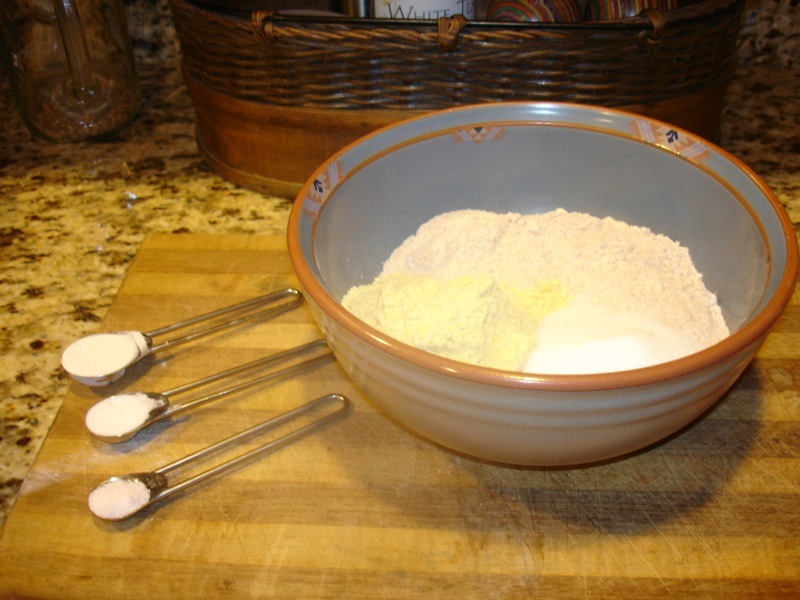 Mix eggs, oil, water, corn and sour cream and add to dry ingredients, mix rapidly and just enough to moisten evenly. Pour into preheated pan. Place immediately into oven. Bake at 450 degrees for 13 to 15 minutes. Top will be golden brown. 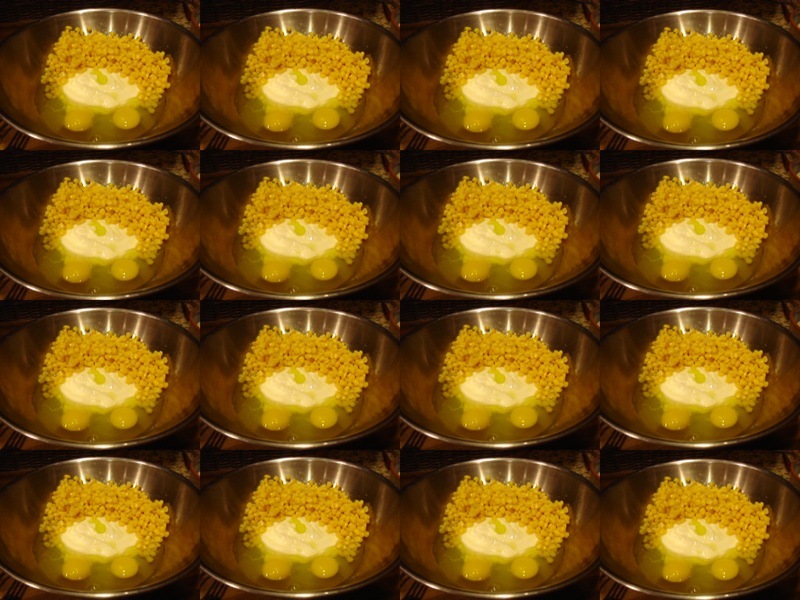 This is where the technical difficulties started - or were there really 16 bowls of wet ingredients? 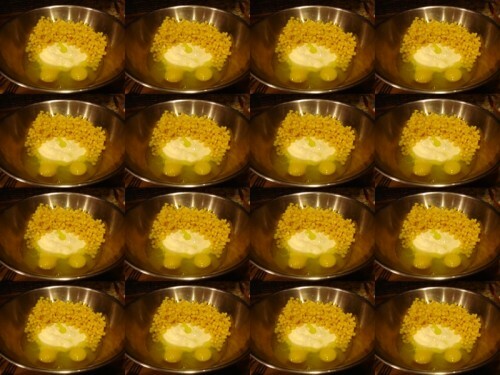 Your picture reminds me that I need to make this soon; I know how great it tastes! This is such a perfect side for a nice harvest soup.